Industrial process control applications can present multi-faceted challenges to those responsible for designing them. There can be many small operations that must coordinate and combine into a larger one. Selecting and configuring hardware to develop the necessary inputs, execute control functions, and connect with machinery via controller outputs may prove to be only one layer of several that comprise a well functioning online process operation. For smaller scale projects, Eurotherm has developed a product that integrates many of the functions needed to develop and execute a process control operation. 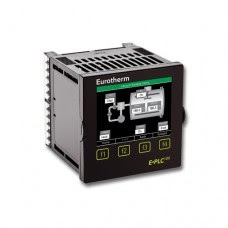 The E+PLC100 bundles multiple necessary hardware components into a compact unit. One can think of the unit as a PLC with built-in PID control and recording, or as a PID controller with logic control and recording. Whatever the case, it can simplify the hardware configuration for a project immensely. Instead of researching and specifying separate controllers, HMI, PLC, I/O, and recording devices and getting them all connected, powered, and coordinated, just configure and program the E+PLC100 with all the functions needed in a single unit. Space savings are substantial, as well as cost, by eliminating much of the time for design, assembly, and configuration of multiple hardware units. The programming of the unit is intuitive, executed on a PC using the companion software. There is benefit to having the whole program for the process on a single unit...no need to coordinate the programming or operation of multiple hardware units. There is much more to learn about the value and features of this truly capable precision PLC. A product brochure is included below, but best results will come from sharing your ideas and process control challenges with a product application specialist. Combining your process knowledge with their product application expertise can streamline your project completion time and move quickly toward an effective solution. Compact Precision PLC With PID, Recording, and More from Hile Controls of Alabama, Inc.